Over the past several weeks, members of Socialist Alternative, Spokane Democratic Socialists of America, and a number of community organizations have organized fierce resistance in Eastern Washington to fascist-friendly senate candidate Joey Gibson. Gibson, whose crowning achievements include being shut down at the University of Washington and assaulting anti-fascist demonstrators, has recently embarked on a sham “senate campaign” on the Republican ticket in an attempt to gain legitimacy for himself, his organization (“Patriot Prayer”), and his allies in far-right organizations such as the Proud Boys. Socialists and activists in Eastern Washington learned of Gibson’s intent to campaign in the area in early March. This announcement came after the fascist/white nationalist organization “Identity Europa” engaged in a small spree of flyer-posting in Downtown Spokane and on university campuses. In March, Gibson planned to hold a meet and greet at SpringHill Suites in Kennewick on the 24th, as well as a rally and march at Centerplace Regional Event Center in Spokane Valley on March 25. The left quickly organized an effective call-in campaign to both venues detailing the reactionary politics of Joey Gibson, as well as his organization’s history of violence and accommodation to the far-right. This call-in campaign was successful. In Kennewick, Gibson’s event was cancelled. In Spokane, local media outlets such as The Inlander derided Joey Gibson as a “Magnet for the Violent Alt-Right,” and momentum was built towards a counter-demonstration. Patriot Prayer also cancelled the “march” portion of their event, and had about as many police and security guards at their event as attendees. 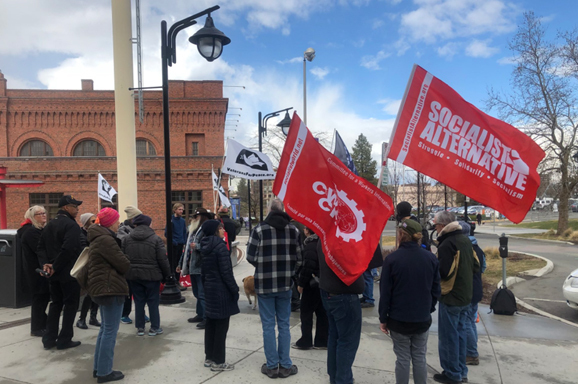 While Socialist Alternative would have preferred to demonstrate against Joey Gibson directly, we were still proud to participate in an energetic and well-organized protest at Spokane City Hall, which outnumbered the far-right’s turnout by a significant margin according to multiple media outlets and our own counting. At the rally on March 25, members of Socialist Alternative elaborated on the crucial need for mass action against the far-right, labor-community defense coalitions, and an independent party of the 99%. During the subsequent march, chants such as “Spokane is a union town, labor shut the fascists down!” echoed through downtown Spokane. All was not and is not said and done in Spokane, however. Just a few days later, Joey Gibson and Patriot Prayer once again announced their intent to visit Spokane. They planned to appear in Spokane’s under-construction rotary fountain in Riverfront Park on April 15. Socialist Alternative and Spokane DSA weren’t slow to respond, quickly planning a counter-protest. Once again, we would demonstrate at City Hall, only this time that meant we would be within two blocks of Gibson and his goons. Patriot Prayer, upon realizing that it likely wasn’t a good idea to try and meet up in a closed construction site with or without a permit, relocated their event to a parking lot across the street from City Hall. Presumably, they intended to resort to their typical tactics of confrontation and provocation. Except they didn’t! Shortly before an event the day before held jointly by Socialist Alternative and visiting members of the Freedom Socialist Party, Patriot Prayer cancelled their planned appearance for the 15th, citing a family emergency. Our planned demonstration for the 15th went ahead in a calm fashion, although with reduced turnout: presumably due to the lack of far-right thugs to confront. While Socialist Alternative doesn’t wish family emergencies on anyone, we’re certainly glad Joey Gibson didn’t come to Spokane on the 15th. We, and those who have worked with us over these past few weeks, will continue to oppose the far-right every step of the way.